The most basic, primal, reduction of the notion of self-defense is the protection of a baby in the womb. It totally trumps castle law and threats to life and limb. If a pregnant woman rips out a man’s throat, or shoots or stabs him, all she has to claim is she was protecting her baby. As long as she can plausibly make that claim, no jury in any civilized country would convict her. Even a child would at least have to make the case that running away was a bad option, or that lethal force was justified, but a pregnant woman unaided and under attack can get away with almost anything. Obviously pregnant women do everything possible to avoid having to fight, above and beyond the rest of us, which is probably why their case for justified self-defense seems so strong, so pure. But that’s an aside, here is the main question. What is the psyco-physical state a female uses to protect her fetus and, by extension, small children close at hand? Pregnant women, in my limited experience are often happy and relaxed. Compared to the average person they have virtually zero abdominal tension. We understand this viscerally. If we were carrying a baby inside our body we would be careful in all our movements to not transmit tension to the baby. The way we walked, moved our arms and turned our head would all keep in mind treating the baby with loving care. We would avoid shaking or bouncing unless the baby seemed to like that. And when the baby was sleeping we’d probably be careful to move in a way that wouldn’t wake the baby. A woman who is pregnant is doing this all the time. So in the event that she needed to fight, it seems possible that she would maintain this attitude or at least be physically informed by it. Think for a moment though, how such a fighting style would look. First of all, it could not rely on structure or rooting because pregnant women tend to have poor structure and balance. They have a lot of mass to wield, but the movements of the arms would likely be used clear a large area around the belly while attacking in circles. The mind, rather than focusing on death points to attack, would be using massive force to throw an attack back. In other words, a pregnant woman might fight using the tai chi and bagua notion of a giant rolling ball. The mind of the pregnant women, if she made the actual jump to fighting, would be fierce beyond reckoning. A parallel with the concept of “xu” we have written about before is pertinent here. “Xu” literally means fake, but in martial arts it refers to a body which is not giving off self-identity signals, a body which does not respond to pain, a body which has let go of all tension. The pregnant woman who has made the jump to fighting is fighting for the baby, not herself. The experience might be de-personalized, the baby has needs, the baby is the future, what happens to the outer body is secondary, the outer body can risk being destroyed as long as the baby is fully and totally protected. This seems to invoke the image of two bodies, an inner one and and outer one completely differentiated-- a qi (potent energy) body, surrounded by a jing (relaxed mass) body. To make this match up with the standard internal martial arts lingo is a small leap. 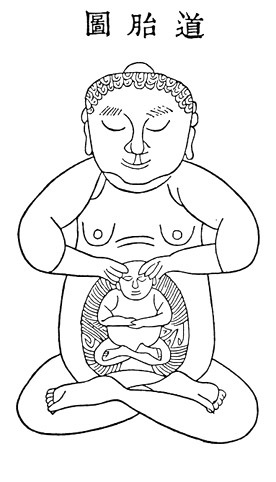 The inner body (the baby) is qi, it is potential energy, pure animation which is round in shape and when awake, can extend several feet beyond the outer flesh body of the ‘mother.’ The qi body (the baby’s needs and perhaps its will) seems to take over the mother; however, the qi body is blind to what is happening outside, so it must be led by the mind. 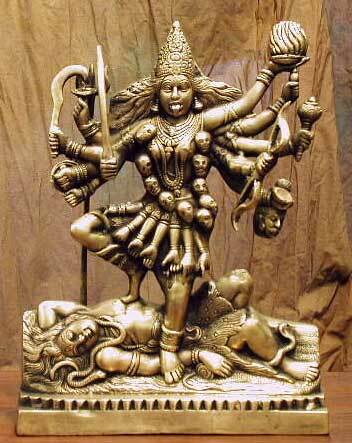 The mind of the mother controls the space and defines the environment around herself. The mind goes first, the dynamic energy of the baby (qi) follows the mind. The mass of the mother’s body (jing) always puts the baby energy ahead of its own needs. The shen (spacial mind) leads the qi (energy body) and the qi leads the jing (body mass). 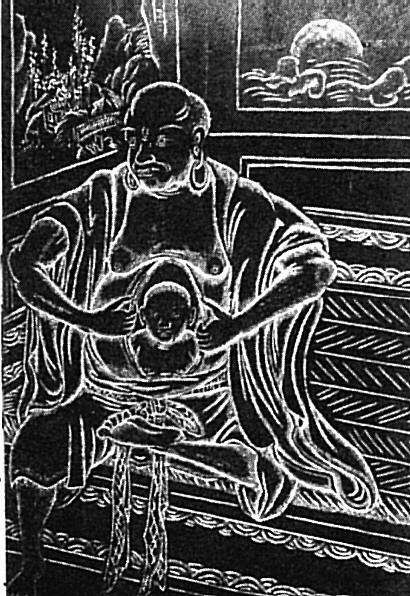 This appears to be a very obvious, though over looked, explanation of why Daoists have so often used the metaphor of making an immortal baby to describe the internal elixir practices of neidan, and jindan. Try this practice: Imagine you have a baby in your lower dantian. Try to move without waking up the baby. Do this over a period of months and gradually increase the range on motion in which you can move without waking up the baby. Eventually your body mass will become very quiet. This is called purifying jing. This is, of course, also a description of doing a tai chi form, or so called ‘pre-heaven’ Baguazhang. Once the jing is purified and the body is quiet in motion, then you can experiment with waking up the baby. While the baby is sleeping there will be no power. After the baby is awake, power will seem to come from emptiness. All this suggests a composite mind and a composite body. At the moment we are dealing with massive generalizations and oversimplifications but let me sketch it out quickly. The composite mind has several models. One model is the lizard, mammal, frontal cortex (human)--a three part mind where the lizard is powerfully focussed on survival and aliviating pain, the mammal is obsessed with status, pleasure seeking, emotions and group bonding, and the frontal cortex is all about planning, imagining and rational thought. There are other models too. Models for the composite body come from evolutionary theory. Our bones were once an exoskelatin, a shell which got covered in a wormy substance we call muscle. Each part of our brain comes from a different type of body substance which at some point in our evolution was an independent animal. We are composite forms which tend to organize all these ‘minds’ and ‘bodies’ in standard ways, however, extreme circumstances or carefully designed practices can alter the organizational order of this conscious/unconscious mass of kinetic life energy. Just a thought. It seems to me that in utero, before we get the gender defining hormones, males and females both have a proto-womb. Perhaps this is even true to some extent for pre-pubescent children. I would like to propose what must seem obvious to many people, that this proto-womb is what martial arts, theater, meditation and ritual all refer to as the lower dantain. The womb seems to have some independent connection to mind, as if it was an earlier life form in our evolution, which can re-assert itself when other aspects of our composite body-mind are quiet. When a mother fights, the ground belongs to her baby. Dantian, literally means cinnabar field, red ground. Everything which enters that field belongs to the baby. Even the mother’s own body belongs to the baby. The fighting mind of a pregnant woman has a very unique way of owning space, a unique way of possessing. Contrast this with the social form of fighting that men do. One man pees on a tree to mark his territory with his testicular scent. Another man then does the same thing and they fight over ownership. The peeing doesn’t actually have to take place, it can just be assumed. This testicular marking style of fighting involves a sense of ownership too, but it is less absolute. Subordinate yourself to the dominant male and the fight is off. Fights for status are rarely lethal and are usually resolved with simple posturing. When two men fight over testicular scent, they each extend their minds right up to, but not through, their social challenger. Two testicular scenters engaged in hand to hand combat are usually very close together, but their minds do not extend much beyond their own bodies and thus the jing (body mass) and the (potential energy) remain mostly mixed up within the body. Because the qijing and qi do not differentiate the power is very limited. Which brings us to othering. Othering is the psyco-physical process of dehumanizing an individual or a group of people so that you can kill them without feeling social restraint or remorse. Othering is shorthand for: “Seeing someone as belonging to another species.” Butchering animals may be totally natural on a farm, or while hunting, or it may need some training. Certainly us urban people need to get past our squeamishness in order to butcher an animal. After I caught, gilled, cleaned and iced 128 King Salmon in one day in Alaska I was haunted by fish eyes whenever I looked closely at anything shiny. But other than that, I had successfully othered them. If a person is raised to believe that another ethnic group or tribe is inferior, the process of othering is probably already complete. When a criminal plans an assault, most likely he or she has already gone through a process of othering. It is important to think about because in some cases you may be able to avert an assault by somehow getting the assailant to see you as a member of his tribe. Othering is a justification process. What does the psyco-physical experience of othering do to the mind and body? To successfully other, is to shut off, like flipping a switch, all immediate social impulses. So while it may be possible for a human predator to get close to someone by imitating social behavior, the behavior is not tied to a script, so when the range is right the knife simply goes in. It is nearly always a surprise to the person being othered. It’s also very quick and uses overwhelmingly superior force. Although if simply threatening force is likely to allow the predator to achieve his or her goals then there may not be an actual assault. It seems like the mind in these cases sees a victim as kinetic energy to be controlled or extinguished. It’s not a contest for ownership, total ownership of the space is established before the assault. Mothering is the source of all compassion. Mothering is the psyco-physical process of extending ones mind to include someone or something within ones field of protection. To mother is to project the sense of “my baby” out into space. It is a very potent place to fight from. Othering is nearly the direct opposite of mothering. It is a process of extending ones mind to surround but totally exclude someone or something from the protection one affords himself. And Testicular Scenting is just a cute term for "the monkey dance."